Crysis 3 is the pinnacle of what current generation consoles can produce, says Crytek boss. "I actually think people will be astonished that next gen launch titles from other companies might not be much different from Crysis 3," Crytek CEO Cevat Yerli told CVG when asked what we can expect from his upcoming sci-fi FPS. "I don't think Crytek can do more on current generation consoles than Crysis 3," he added, mirroring earlier comments that console hardware was a massive barrier for Crysis 3. Yerli went on to praise his team for creating a unique visual feel for the game that he believes has never been captured before, not even in movies. On the literal "urban jungle" setting that melds Crysis 1's rainforests with Crysis 2's cityscape, Yerli said, "It has not even been done in Hollywood. People might suggest there are similarities with I Am Legend, but that is quite different to this. I Am Legend is overgrown, but Crysis 3's urban rainforest is a whole different level of that. It has its own identity and I'm very proud of what the team achieved in this regard." Crytek have been long-time proponents of the PC, turning only to consoles after disappointing Crysis 1 sales. Many fans felt that Crysis 2 was held back by the limitations of current gen consoles, but Crytek are aiming for Crysis 3's definitive version to appear on PC, claiming that gamers want a reason to upgrade their hardware. 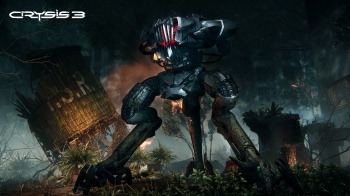 Crysis 3 will be released for the PC, PS3 and Xbox 360 on February 19. When asked about a Wii U version of the game, Yerli said that the system is definitely powerful enough to handle it, but EA doesn't see the value in porting the game to Nintendo's console.